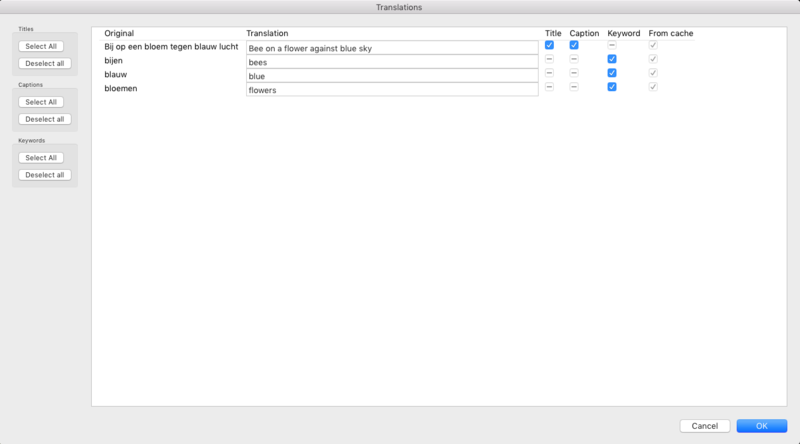 The translator plug-in translates Titles, Captions and Keywords into a target language. Translating titles, captions and keywords is arduous and tedious, a necessary evil. I do not know of any photographer who takes fun in it! However, when for example, delivering to stock agencies supplying titles, captions and keywords in English is a requirement. And if selling is your business, good meta data makes the difference! Of course there are many more use cases where translation of these meta data is required. Further you have the ability to correct translations before they are applied. Lastly, all translations are cached locally, so that you do not have to correct the same translations over and over again. Since the plug-in works with Google translate any combination of languages supported by Google is also supported by the plugin, see supported languages. For many stock agencies titles, captions and keywords in English is a requirement. When English is not your native language you'll have to translated these. The problem solved is the arduous and tedious work of translating your titles, captions and keywords. Multiple photos can be processed in one run. Improved translations, because Google did not got the right translation, are used and cached for the future use. You create your own translation dictionary. Download the trial version and experience for yourself! This version has all the functionality but is limited to five photos per run. The plug-in retrieves all titles, captions and keywords of all selected images. These words and phrases are send to the translation web service. For now, this is the standard Google translate, like https://translate.google.com. Here you can optionally improve the translations. No correction means simply pressing "Ok"
Are cached for later use. Below you see an example of the translation pop-up of step three above. Only the selected ones will be added to the images. Right section: correlation between the translation and it's source: title, caption or keyword. Default all titles, captions and keywords will be processed. With "Deselect all" no translation will be written to the photos for titles, captions or keywords. In the middle section the original titles, captions and keywords and their translations are listed. You can improve the translation. Every improvement will be used and stored in the local cache, so the next time this keyword is found your correction will be used. The check-boxes display where the translation was found and where it will be stored. For example, the translation "blue" was both found both as a caption and as a keyword. When you click the "Ok" button, "blue" will be added to the caption and the keywords. However, you can deselect individual translation from being applied. If a check-box is greyed out this means that either the translation was not found in that source, title, caption or keyword, or that in the Plug-in Manager you selected not to process that source. This check-box is only an indicator where the translation came from. When checked, the translation was found in the local cache, when unchecked the translation came from the translation service. Select the "Translate" from "Translator"
The top three options concern the translation web service used. This version only supports the free translation service of Google Translation. Language to translate from / to should be set to your liking. The available languages and their abbreviations can be found here. When translating titles or captions, the translation is concatenated to the original title or caption and separated by a "separator". You can determine which separator to use. In the example below the Dutch title "Paard in de wei" and the English translation "Horse in the paddock" will result in the title below. when checked titles will be translated, when uncheck the titles are ignored. When checked any title containing the separator character will be skipped. By default you want to have this option checked because when the plug-in is run for a second time, you don't want the translation for "Paard in de wei ; Horse in the paddock". the character(s) used to concatenate / add the translation to the original title or caption. In the example above we used: <space><separator><space>, see example above. For more info, see the title paragraph above. The translation will be added to the original keyword as a synonym. A new keyword will be created from the translation. This new keyword has the same parent as the original keyword. If the keyword "blauw" is a child of "color", the new "bleu" keyword will also be created inside "colors". Let's use the example above. The plug-in translates the "blauw" keyword to "blue". When the user clicks "Ok" in the dialog, the plug-in will create a new keyword called "blue" and add that keyword to the photo. So now the photo has both the "blauw" and the "blue" keyword. When the plug-in runs again, it will find two keywords on this photo: "blauw" and "blue". Of course the last one is a translated keyword and should not be translated again. In the background the plug-in will add all translations to a cache of words that have been translated. Now when the plug-in runs again, it will skip all keywords found in this cache. So only "blauw" will be picked for translation. When checked, before requesting the translation from the translation service, all words or phrases translated previous are skipped from the request. They are retrieved from the cache. There will always be translations that need improvement or alteration. It would be a bad thing to have to correct these translations over and over again. Using the cache will give you more consistency in the used translations, because each time the same translation is used. Much higher performance, because no or less calls need to be made to the translation web service. When contacting the free Google translation service to often, the might think you are a bot and will block you for some time. This is also the reason we implemented a little sleeping time between calls. Each request to the Google translation web service can have at max 5000 characters. If the requested translations require more characters, the web services is called multiple time.